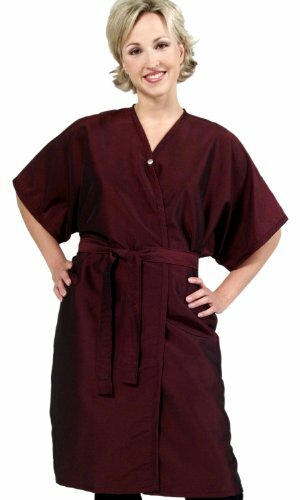 Salon / Spa 8703 Client Gown / Kimono Wrap by The Cape Company. #1 requested client gown by the salons and stylists we work with for their quality and comfort. This client gown is known to last 10+ year with constant use and laundering. FEATURES: •Oversized fit - 60" total width around •One size client kimono wrap, smock, gown •Overlapping front •Short sleeve - 17" long from neckline •Knee length - 41" long from back neckline •Attached belt •Modesty snap •Medium weight Silkarah fabric - 60% nylon & 40% polyester •Available in Lightweight Silkarah: Black Made in the USA + FREE YS Park L-Clips ($15 value). If you have any questions about this product by The Cape Company, contact us by completing and submitting the form below. If you are looking for a specif part number, please include it with your message.